Blades are special weapons. Not only do they injure, but they do so in such a way that both combatants experience the attack. Purposely choosing a blade over a gun can show a higher level or rage and deeper need to physically experience the suffering of the victim. In this third installment on blade damage (Week 1, Week 2), we are going to look at the actual wounds caused by blades. 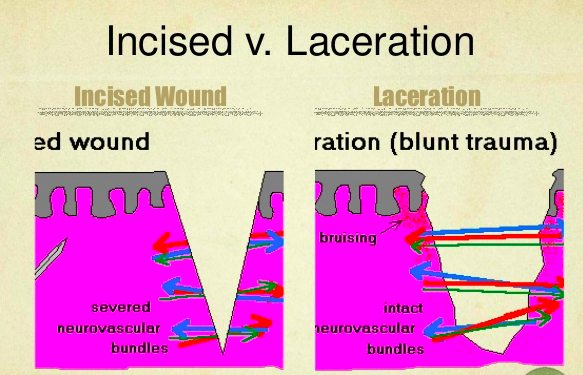 First, let's differentiate in the types of wounds: incised cuts, lacerations and stab wounds. Now, if you look in a thesaurus you will see the first two words are synonymous. But, in medical terms, they aren't. 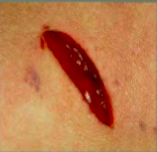 An incised cut is a slash in the tissue caused by sharp-force trauma. The wound maintains very clean, sharp edges and tends to be longer than deep. There is no tissue bridging or strands of still intact tissue joining the sides of wound. Because of the clean line of injury, incised wounds are easier to stitch. 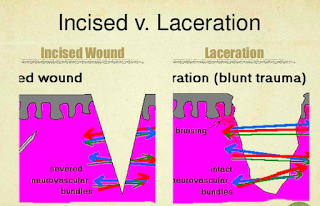 Unlike the incised wound, a laceration isn’t so much a cut in the tissue as a tear. Lacerations are caused by shearing, crushing, or blunt-force trauma. They have irregular edges, tissue bridging and are more common on bony areas. 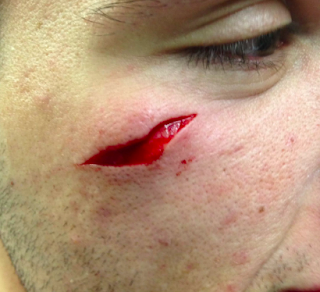 Lacerations are more likely to scar and become infected because of damaged tissue. And, because of their irregular edges, they can be very difficult to suture. How different do they look? Very. You can pinch an incised wound close and it will be a clean line. That's not the case with a laceration. The edges are jagged. Here's some examples and they're gross. I will scoot down a bit so you can prepare yourself. I made sure that in all the pictures the person was living. There are no pictures of dead bodies. And, the pictures in which I wasn't sure, the wound shown wouldn't have been enough to kill anyone. These are incised wounds. Notice that you can pinch the edges and bring them together to form a straight line. That guy's tattoo will never look the same. 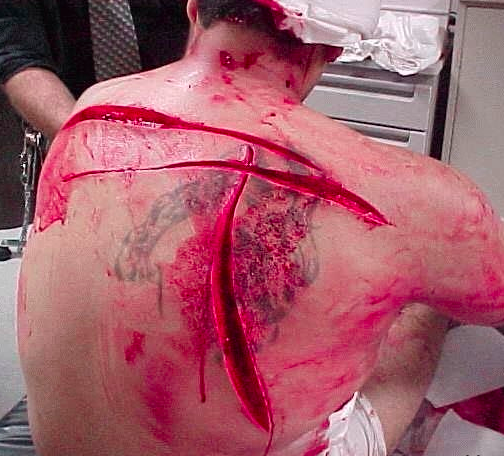 Laceration - I doubt this was caused by a blade. It was hard to find a laceration wound caused by a blade on a person who I could tell was still alive. But, it shows the difference without making you throw up in your mouth. Can a blade cause a laceration? Yes, big, heavy swords caused them all the time. The purpose of such blades wasn't cutting so much as bashing through shields and armor. 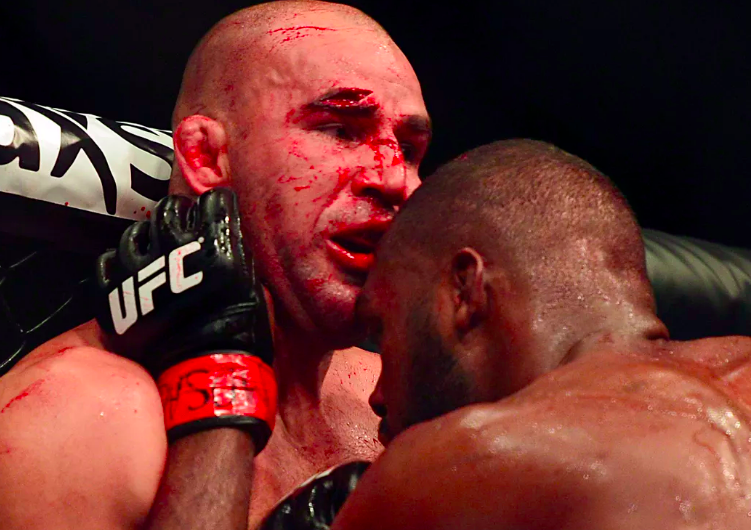 If contact was made with the flesh in such a blow, a laceration was a result as well as crushed bones. Which leads me to blades that are used for chopping such as axes, machetes and cleavers. Don't worry, I have no pictures. All that I found were so horrific I found them disrespectful to life itself. BUT, I can tell you how they look different and they all do. Ax lacerations are straight lines that look like the skin has popped. There are crushed bones and tissue. Machete wounds are straight lines and very deep, deeper than an ax, best I could tell. 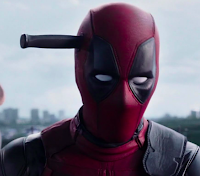 That's likely because a machete has a shape that lends itself to be drawn in a slicing motion after the impact. Also, there is more cutting surface than in an ax so, again, longer and deeper cut. There's no crushed bones because a machete's design doesn't lend itself to crushing. But, bones can be cut through. Cleaver chops are clean, thin wounds that don't break bone but do leave cut lines on them. A stab wound is neither an incised cut nor laceration. It is a type of puncture and there are two types: penetrating and perforating. Penetrating stabs, as the name suggests, penetrate the body. The wound doesn't always match the size of the blade because blades are seldom driven in and removed at exactly the same angle. Also the skin can shrink up a bit after the blade is removed. 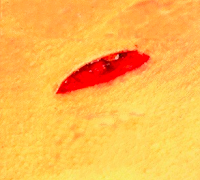 If the wound is from a double edged blade, both sides of the wound will have points. In this double edged injury, there's a bruise which tells us two things. One, the blade had a guard. Two, this blade was completely plunged into the body. Last but not least, remember that the body has an internal vacuum. If you open up the abdomen, innards can become outers. I will spare you an actual picture. 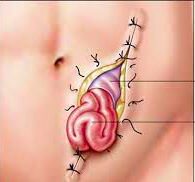 And, although this is a post-op depiction of why one should never be sutured with nose hairs, know that any breach of the abdominal wall can cause this. In sayoc, we call a low abdominal slash a "blue worm" for reasons you can likely deduce. I was going to include an instructional video on suturing but I'd say we've seen enough blood and stuff. I will save that for next week. 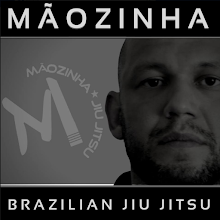 Instead, let's all take something for nausea and watch this completely perfect instructional video with Master Ken and Kali expert Doug Marcaida.